Crate Paper design team member, Jen Chapin, preserves two of summer's most popular icons on two separate, colorful revamped clipboards–popsicles and pool time. Thankfully, Crate Paper's Poolside collection indulges in both! Hello there! Is it summer yet where you are? Here in the Midwest, temps have been up in the 80s and we are taking advantage of it! Today I am going to share a few embellished summer-themed clipboards that I created with the Poolside collection. I made one pink for my daughter, and the other blue for my son. 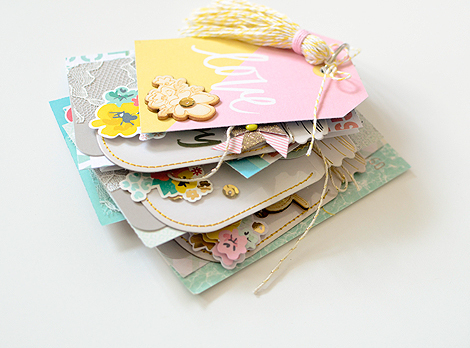 As you can see, there are plenty of paper and embellishment options in the collection for either color! For the pink clipboard, I layered some patterned paper along with my photo, then added some gold acetate, a heart clip, and some other assorted chipboard and wood veneers. For the blue clipboard, I used some more patterned paper, along with a few cardstock embellishments from the ephemera pack. I also used one of the word Thickers from the collection - my favorite! Thanks so much for stopping by! I think I will display these somewhere on my mantel to keep us in the summer spirit. Have a great day! MARCY PENNER: I'll admit, I had no idea what I was going to do for the crate theme this month. All I knew was that it involved a clipboard. I knew I had a small one somewhere. Once I found it (my room's under construction, so it took a while), I noticed the large "5" I had clipped to it and an idea formed. The large number I had clipped to it was from one of those perpetual calendars you get at the bank (or wherever)...the ones where you flip the number everyday. It dawned on me that this would be the perfect countdown for summer holidays! I started by gathering up some supplies from the Poolside collection I thought I'd use...papers to layer and embellishments for the bottom half of the clipboard. I trimmed my first paper slightly smaller than the clipboard. And my second paper slightly smaller than that. I purposefully put the "busier" paper at the bottom of the pile. I layered those two, plus a piece of vellum, and a number to the clipboard to see how much room I had to work with at the bottom. I pulled out a smaller frame, die-cut and chipboard word from the Poolside collection and played around with their arrangement on the bottom half of the page. I decided to run the frame and die-cut across width-wise and then slightly layer the title over them. To fill in the frame a little bit, I layered another die-cut underneath it and added a flamingo button. It didn't quite feel like enough, so to fill in a little more space, I typed out a little title, trimmed around the words and adhered it on to the vellum. None of my embellishments are adhered near the top, so the large countdown number can easily be removed and switched out for the next one. I kinda think that I might recycle this idea for an advent calendar this year as well! It's nice and simple with just a bit of fun. It is the very last day of Crate Paper's Summer Inspired Mason Jars series. This final project is brought to you by Crate Paper Design Team Coordinator, Christine Middlecamp. I'll admit that I skipped right over the whole "Summer" thing and went straight way to 'Cats' instead. Over the years, I managed to collect more kitties than I care to confess. I blame it entirely on the "Vet Tech" in me, an old career I left behind in my late twenties. To this day, I LOVE cats more than anything in the world (minus chocolate & my little kiddo). 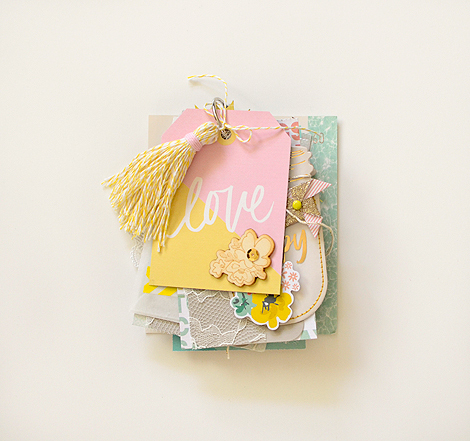 This 'Craft Market tag' is from the collection's ephemera pack. The pack contains at least two or three tags that can be easily slipped onto a ring as a mini album accessory. The back of the tag is covered with patterned paper. A 'Poolside Ephemera die-cut' and 'wood-epoxy embellishment' sit side-by-side above my photo. They are anchored by a piece of zigzag from the Journey puffy sticker pack. The album is constructed of different size/shape pages. I love the randomness of it. It leaves open plenty of opportunity to experiment with various page sizes and composition ideas. The first pocket in the album holds a photo of my boyfriend's sweet kitty, Ruby. Tucked inside with her are large black sequins, the letter "F" for "feline", and the word "love". Around the neck of the jar is a border of zigzag felt & tied twine. I often buy random 'non-specific' paper supplies to use on projects. This page is an actual 'black' plain mini pocket pouch that is decorated with plain graph patterned paper, light peach cardstock, a 'Poolside' frame sticker, a 'Craft Market' wood arrow, a section of vintage velvet ribbon and finally, a 'Poolside' sequin heart. It's a simple, sweet compilation of exactness. Tucked inside are the names of my four cats and their age. Believe it or not, this was the very first page I made for the album. Yes, I'm in the habit of creating pages 'out of order'. Typically, I decide on the order of the pages at the very end. Much easier that way. Here we have another jar pocket with a photo. Because the jar had a pre-printed title in the center, I focused much of the embellishment work along the neck of the jar. The flower is handmade from felt & netted flowers, striped pattern paper, cardstock circles, a vintage B/W button and a pretty rhinestone. This tag plays two roles - The front is purely decorative and on the back is a photo with two kitty names. On the last page, I explain the purpose of the album - 'cat nerd' all the way. The gold glasses befit the theme perfectly! The final addition, a '#4 Poolside metal clip' (current number of cats) and "Memories" chipboard piece, was slipped onto the ring prior to my closing it off with ribbon. And that brings us to the end - my love for cats is undeniable, as is my love for mini albums. Both are a treasure to behold. You don't have to go overboard with our Mason Jar Pockets to make something cute and gift-worthy. Laetitia Poissy has a surprise glassine bag idea that is simple and prettier than anything you'll find at a store. LAETITIA POISSY: There are a multitude of ways to use Poolside's beautiful mason jar pockets. Today, I want to present two different projects that give boost to the jar's cuteness factor. This first creation is a quaint gift bag meant to hold small surprises like candy or whatever type of tiny something or other you might have in mind. It's quite simple to put together. I selected an assembly of small items from the Poolside & Confetti collections. I then chose a blend of sequins that corresponded with my embellishments and had a 'festive' feel. I slipped the sequins inside the jar, leaving them to roam freely. Underneath the jar, I layered two sheets of pattern paper and stitched around the top to create a 'sort of frame' for the jar to sit in. Finally, I decorated the jar with my chosen embellishments, keeping them vertical and somewhat overlapped. The finished bag includes a cute gold glitter clip from Crate's Craft Market collection. Don't forget to add treats to the inside! Moving on to my next project, a "holiday at sea" mini album, I went a slightly different direction with the jars. I love the idea of pairing a special memento with a photo, together, in one of the mason jar pockets. Here, I captured a photo of my little girl walking in the sand while visiting a beach on holiday. I tucked it inside one of the jars and added a sprinkling of sand. To keep with a Summer theme for my album, I accented the jar with a popsicle and sun from Poolside's Ephemera Pack. I love the collection! It makes me want to take a second vacation! And there you have it, two jars --> two ways! Don't forget about our Poolside Mason Jar Challenge that is currently in the works–get the full scoop HERE. Looking for something cute and inspiring to help pass the time? Make yourself at home as our fave DIY CP Gal, Rebecca Luminarias, is here with a Poolside mason jar mini album that is perfectly sweet and totally stylish. Scroll down to find out more about it! REBECCA LUMINARIAS: Have you been getting inspired to use the mason jar pockets over the last few posts? I know I have, so I'm glad I didn't use them all up on this project because, thanks to the other talented ladies on this team, I have many more ideas for putting them to good use! I've always adored the look of a mini album held together by a metal ring, with bits and scraps peeking out from each page...a stack of lovely layers so thick and enticing that you just want to hold it in your hands and pour through it, bit by colorful bit. That's the basis for this album, only I turned my pages into tags instead of pages of photos and memories. Do you see all of that pretty Poolside eye candy in this shot? Pink and yellow is one of my favorite color combinations and I was drooling over this 'love' tag the first time I saw it as part of the Flip Flops patterned paper. It brings to mind pink lemonade, which is a delicious and refreshing summer treat. Coincidentally, doesn't pink lemonade taste even better when consumed from a mason jar?! 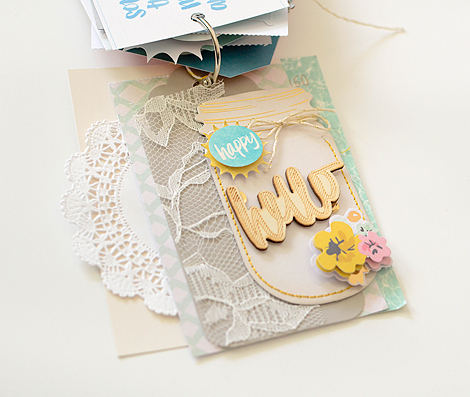 Each of my 3 mason jar tags here have similar elements to create a cohesive feel: a background paper from the Confetti 6x6 paper pad, a gray tag, and a swatch of lace. I also tried to incorporate some gold twine and a floral element. Having a theme helps me work faster when creating. Because these sweet jars are actually pockets, I also tried to put a little something inside each one. In the other 2 it's sequins; in this case it's the tiny floral heart toward the top of the jar. I just slipped it inside with a hint of adhesive to be certain it stays in place. May I also point out that even though the patterned paper is from Confetti and the floral die cut is from Poolside, they are perfect coordinates, don't you think? 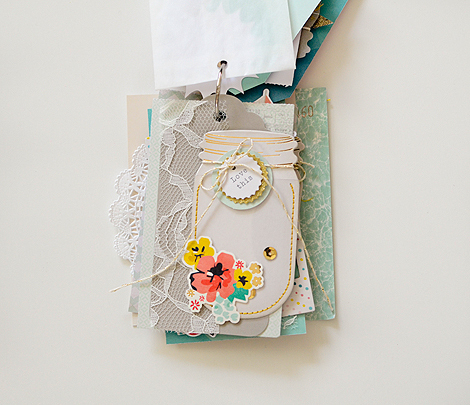 I wanted a lot of pages in my little book so in between each jar tag I put in one or two other fun elements. I felt that the entire project had a cheery and colorful feel to it so this interlude was created with that in mind. Hello sunshine! Glassine adds a soft, translucent texture (and the most heavenly sound!) and while I haven't put anything inside of this envelope yet, I included it for future use. The set of mason jar pockets comes with an assortment of accessories like gold sequins, gold twine, and the cutest little tags and die cuts. Most of those I didn't use for this project because I've got them earmarked for another one, but I did have to use the 'love this' tag. I layered it with a mint circle from the Poolside Ephemera pack and tied them all to the jar with some twine. Another 'inbetweener', this time using a wood word from my personal stash, a Poolside photo frame, and some die cuts. Ending my mason jar tags with a Happy Hello! A little backwards, perhaps, but in actuality just trying to close my little book on a positive note (wink, wink). Here's a tip: *Never overlook good packaging! 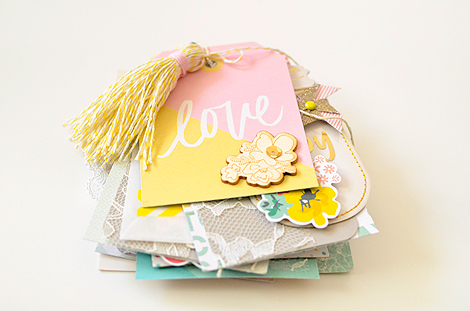 * Crate Paper's embellishments always come with the prettiest packaging and I often use it in my projects. This cream and aqua card is the backing for the Poolside Standouts, trimmed and turned on its side. I keep most of the packaging that Crate items come with, especially pieces like this, because they're heavier than standard patterned paper or even card stock. They've come in so handy whenever I need a sturdy base, like for this album. I hope you enjoyed my cheery mini-album-inspired tag book--I have a feeling it won't be the last of it's kind that I make. And I hope you've been further inspired to pick up a set of these fun mason jar pockets. They will be a fantastic addition to your paper crafting collection! Sure, Poolside's mason jar embellishments are cute all by themselves, but what if you were to pair one with an actual glass 'mason jar'? CP Gal, Marcy Penner, gives the idea a try while thinking about her family's future Summer adventures and curious collection sprees. 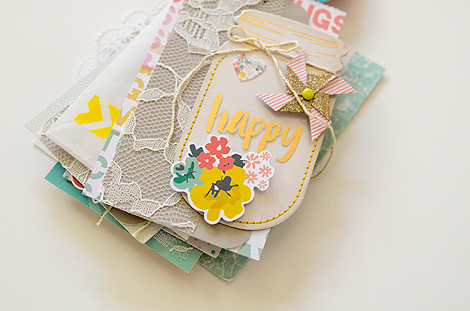 MARCY PENNER: I hope you all are enjoying our themed projects on the blog these last few days! I'm thrilled to be taking my turn today. So, here's my thinking. If one jar is good, then two jars is awesome, right? My thought was that a jar would be a great place to keep all those little treasures over the Summer. You know...collected rocks, ticket stubs...things like that. I started by grabbing a large shipping tag and one of the jar embellishments from Poolside. I pulled out some other die-cuts and smaller embellishments that I thought might layer beneath and over it well. I tucked a narrow die-cut right in the pocket and typed out some words that listed a couple of the things I thought we might accumulate this Summer. I tucked those into the pocket as well and finalized the rest of my embellishments. I decided to just build on top of the mason jar, so that meant finding a few embellishments that were smaller than the jar. I strung a piece of string through all the embellishments and tied it at the top. I grabbed a large mason jar from our pantry and tied my embellished tag around the top. And just like that I have a jar that's just waiting for some warm weather and adventures. I can't wait to see what we all gather this Summer! Submit a photo of the project to cpblog@cratepaper.com by Sunday, May 31st. A grand prize winner will be announced on Monday, June 1st. On the day of the announcement, we'll share images of the winning projects (1st, 2nd & 3rd Place Winners). They will be selected based on creativity and quality. There are THREE prizes up for grabs: 1st place takes home a fabulous size bag of Craft Market & Maggie Holmes Confetti products. 2nd and 3rd place winners receive a sizable bag of Journey goodies. This is our first time offering three prizes at once! All you have to do to participate is make something awesome & unique! Good Luck - we're counting the days to see your Mason Jar Pocket creations! MARIA LACUESTA: The Poolside Mason Jars, like their real life counterparts, can be used for a myriad of crafty endeavors. So this week, I decided to create a couple different projects showcasing these adorable pockets. In my first project, I used one of the white mason jars to create a dashboard for my planner. I like the idea of being greeted by something inspirational every time I open up my planner. Here, I included the words, "create something everyday", because this is a goal I want to focus on right now. I printed out the word strips on white sticker paper, so I can peel them off the plastic. I may want to replace this goal with another one once I master it. I kept my embellishments simple. In the top right corner is a cute metal clip from the Poolside collection and inside the Mason Jar are gold sequins that I tucked inside. Then, I used a Sharpie to draw shine lines above the jar. I love the idea of filling Mason Jars with little treasures and in this project, I'm literally filling my jar with words and ideas that are important to me. I continue this theme in the scrapbook layout below. In this project, I used an assortment of embellishments that came with the Mason Jars and positioned them so they're streaming out of the jar and off the page. I also mixed in pieces from the Confetti collection by Maggie Holmes and, again, included sentiments inside the jar that are close to my heart. I had so much fun creating these projects and I still have four more jars left. I'm already thinking of other ideas and I definitely want to include one of these amazing jars in my pockets pages. By far, the most popular Poolside embellishment is the ADORABLE Mason Jar Pocket Pack. Not only are the jars the cutest thing ever, but they have extra room for storing tiny items like sequins, die-cuts and more. The tops open up and from there, anything goes! Because Poolside is ultimately a Summer collection, the CP Gals are bringing you a week's worth of Summer 'Mason Jar Pocket' ideas as a special feature for the month of May. Joining you with the first "Summer-inspired Mason Jars" installment is CP Gal, Jen Chapin. 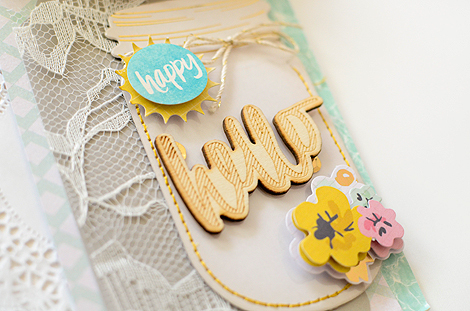 JEN CHAPIN: Hello and welcome to today's blog post all about the new Crate Paper Poolside mason jar embellishments! These mason jars are so unique, I just don't think I've ever seen anything quite like them! Here is a closer look. The chipboard jars come 6 to a package along with some other embellishments - tags, twine and gold sequins. The size of the jars is about 3" x 4", they fit perfectly in a 3 x 4 pocket page protector. Here's a look at what you'll get inside the pack: 6 mason jars with gold stitching and acetate pockets, some plain and some with gold wording. 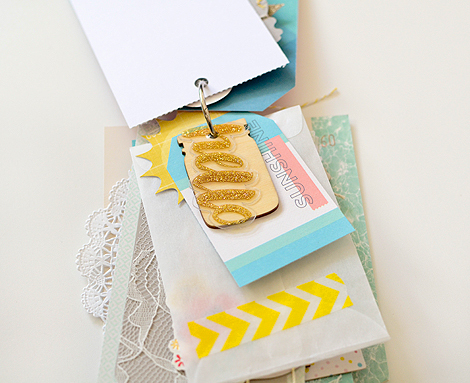 You will also get these cute tags and glitter embellishments, along with twine (not pictured) and some gold sequins. Here is a fun idea for the sequins - pop open the pocket on the mason jar and sprinkle a few in! They stay put and it looks so fun. Here is a closer look at my title work. I added 3 jars to this 8.5 x 11 layout along the bottom under my photo. I put some sequins in a few of the jars, and tags in the other. After that, I added a gold glitter foam word from an earlier Maggie Holmes collection. I used a large photo for this layout, printing it in black and white at 8.5" wide so it would stretch across the top half of my page. I also added a wood veneer and pinwheel embellishments from the Poolside collection. And here's another view of the finished project! These jars are so fun. I hope you can get your hands on them for your Summer projects! They would be fabulous on all types of projects....not just scrapbook pages. It would even be fun to use them as a tag on a mason jar gift of some sort. The possibilities are endless! Thanks so much for stopping by today, hope you have a great day! When it comes to simple scrapbooking & documenting everyday life, Marcy Penner pulls it off effortlessly. 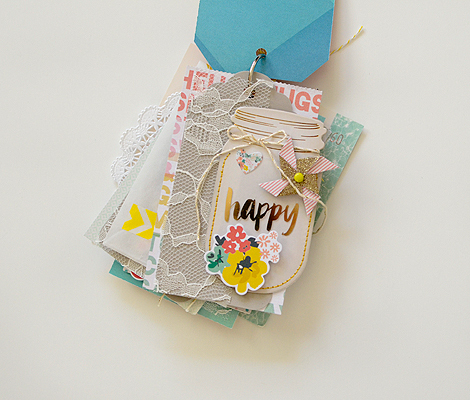 This latest pocket page spread is a perfect example of this and as a bonus–a freebie step-by-step tutorial from Marcy herself. Sometimes I just don't have a lot of photos. Sometimes it's because I just didn't take a lot and sometimes it's just because of having breaks in my album, like title pages for months and so on. I like to include random thoughts and accent cards in my pockets when that happens. Also, the photos I had to deal with were pretty light and had a lot of white space in them so I wanted to make sure that I played up that part of the design in my pockets too. I started by placing my photos in the pockets. I want to transition to mostly 3 x 4 photos in my spreads, but the spread behind this one still has a 4 x 6 photo in the larger pocket. So, for this spread, I'll need to fill up that larger pocket with something other than a photo. I'm also using a trimmed down (and sewn) page protector on the right side instead of a full-sized one. The full 4 x 6 pocket was a little intimidating so I started with that one first. I rummaged through my die-cuts and pulled out a heart and a gold foil leaf bunch. My plan was to layer some items to create an accent card in this space. It was looking a little plain with just these two items, so I snagged a wood button from the Poolside collection with the idea of adding it to the center of the heart. I gathered some more die-cuts for the other pockets and started moving them around. Die-cuts are some of my favorite things to use in my Project Life spreads because they're thin and light-weight. I eventually settled on using a glittered "N" as a "Z" for the photo of me sitting in my bed and a banner for the card underneath my other photo. I moved a forgotten Anthropologie gift card into one of the 3 x 4 pockets and moved the "Z" over to the photo pocket. Now that I was mostly happy with my layout, I started working on the individual cards. I sewed down the heart and left the die-cut and added the wood button. It felt a little plain to me, so I added in some journaling as well. 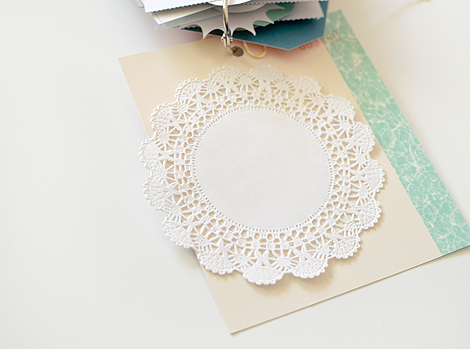 I looked through my die-cuts again...this time looking for something that would work with the Anthropologie gift card. I loved this flower die-cut from Craft Market. I adhered it on top of the gift card and trimmed off the excess. On my last card, I added a mix of typed and handwritten journaling and simply stapled the pennant down. With the exception of the wood button, everything I used on this spread is nice and flat. My cards compliment the compositions in my photos as well, which is always a good thing! Today, Maria Lacuesta has a 'Poolside' mini album to share that requires little effort and only a single sheet of patterned paper. 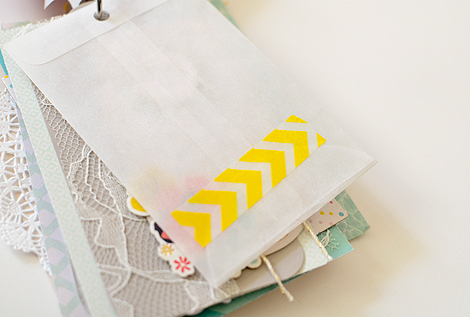 The album is both practical & sweet, and is a smart option for the busy Summer season ahead. Summer is nearly upon us and I wanted to get a jump on my memory keeping by putting together this little tag album with the Poolside collection. I used a small binder ring to bring everything together so that I can easily rearrange or add pages to my album as I begin filling it up with photos. 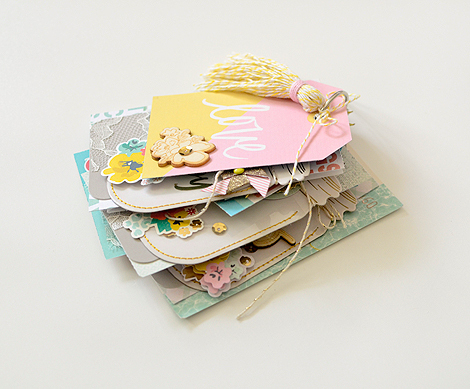 The 'Flip Flops' patterned paper from the Poolside collection was absolutely perfect for this project because I could simply cut apart all the tags and cards to form the base of my album. After creating the base, I added a few bits from the Poolside Ephemera Pack, Metal Clips, and Wood Veneer to embellish my pages. To make the semi-transparent snow cones card, I cut apart the 'Snow Cones' patterned paper and adhered the snow cones to a piece of vellum using my tiny attacher. 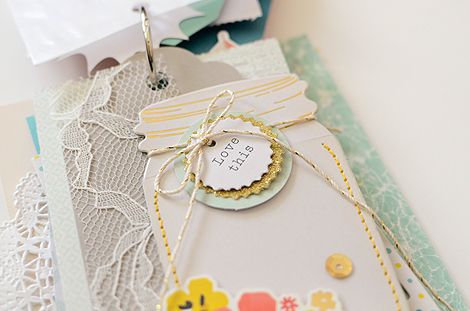 I also used my tiny attacher to adhere a strip of grosgrain ribbon to my card for some added texture. On these pages, I used glitter accents, including a ribbon pennant and the popsicle die-cut. Again, I used my tiny attacher to adhere all my elements. You can also see I used white American Crafts cardstock to create a neutral base for some of the embellishments. I tried to keep my pages relatively simple so that there was room to add photos while still maintaining enough detail throughout so that the album felt "finished". Lace is great textural element! I quickly attached a section of lace to the edge of this card using both staples & gaffer's tape. As you can see, there's still a bit more room in the binder ring to add more pages if needed. I really love the flexibility of this album format. Best of all, this album is really easy to make and doesn't require a lot of materials. I just used a couple of pieces of patterned paper and minimal embellishments. Given how easy this album was to put together, I can definitely see myself creating more mini albums this Summer!